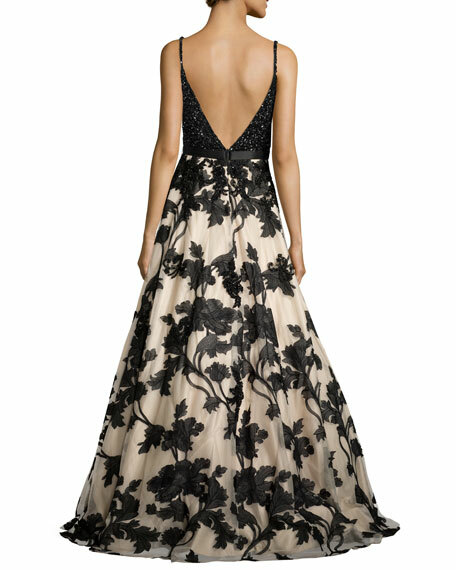 Jovani combo gown, featuring a beaded bodice and floral-embroidered skirt. Plunging V neckline; low-cut V'd back. Founded by Jacob Maslaviand now run by his sons, Saul and AbrahamJovani has outfitted glamorous women since 1980. Fashion forward and classic, Jovani dresses and gowns are as unique as you are. Beyond evening wear, the New York-based line suits many occasions, including prom, mother-of-the-bride, cocktail, pageant, and weddings. For in-store inquiries, use sku #1940505.